We’d love your help. Let us know what’s wrong with this preview of Backyard Bears by Amy Cherrix. North Carolina's black bears were once a threatened species, but now their numbers are rising in and around Asheville. But what happens when conservation efforts for a species are so successful that there’s a boom in the population? Can humans and bears live compatibly? What are the long-term effects for the bears? Author Amy Cherrix follows the scientists who, in cooperat North Carolina's black bears were once a threatened species, but now their numbers are rising in and around Asheville. But what happens when conservation efforts for a species are so successful that there’s a boom in the population? Can humans and bears live compatibly? What are the long-term effects for the bears? Author Amy Cherrix follows the scientists who, in cooperation with local citizen scientists, are trying to answer to these questions and more. Part field science, part conservation science, Backyard Bears looks at black bears—and other animals around the globe—who are rapidly becoming our neighbors in urban and suburban areas. North Carolina's black bears were once a threatened species, but now their numbers are rising in and around Asheville. Can humans and bears live compatibly? What are the long-term effects for the bears? Author Amy Cherrix follows the scientists who, in cooperation with local citizens, are trying to answer to these questions and more. To ask other readers questions about Backyard Bears, please sign up. Wow! Another fabulous entry in this nonfiction series for middle grade. The photographs in this book are fantastic and there is a treasure trove of information about American black bears and the Urban Bear Study. This is really interesting, relevant stuff. I especially enjoyed the author's discussion of other urban areas that are experiencing an uptick in wildlife encounters. Wild turkeys in Boston? Who knew? Excellent non-fiction for middle grade and older students. Outstanding photographs. Another outstanding Scientists in the Field book - this one appropriate for middle grade readers and up. Chronicles a study by wildlife biologists of the the urban/suburban bear population around Ashville, North Carolina. As always, this does an excellent job of explaining the work of the team, the data they are gathering and the questions they are seeking to answer. One fascinating chapter looks at other cities experiencing influxes of various other animals and birds and the extensive back matt Another outstanding Scientists in the Field book - this one appropriate for middle grade readers and up. Chronicles a study by wildlife biologists of the the urban/suburban bear population around Ashville, North Carolina. As always, this does an excellent job of explaining the work of the team, the data they are gathering and the questions they are seeking to answer. One fascinating chapter looks at other cities experiencing influxes of various other animals and birds and the extensive back matter includes information on bears and tips on how to be "bearwise" and how to behave in a close encounter with a bear. Glossary and recommended resources are also provided. 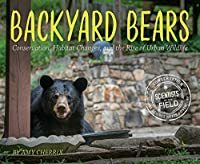 Backyard Bears by Amy Cherrix (Scientists in the Field), 63 pages. Houghton Mifflin, 2018. $19. Cherrix takes a look at an animal-human interaction going on in her own backyard – Asheville, North Carolina. It’s illegal to hunt black bears within the city limits and the bear population has grown from 1500 in 1970 to 19,000 in 2014. This has led to some interesting interactions between the humans and animals of Ashville. 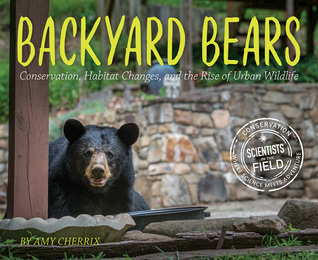 The Black Bear Study Backyard Bears by Amy Cherrix (Scientists in the Field), 63 pages. Houghton Mifflin, 2018. $19. Cherrix takes a look at an animal-human interaction going on in her own backyard – Asheville, North Carolina. It’s illegal to hunt black bears within the city limits and the bear population has grown from 1500 in 1970 to 19,000 in 2014. This has led to some interesting interactions between the humans and animals of Ashville. The Black Bear Study has been working hard to educate the human part of the education and most residents have jumped into the project enthusiastically. Another nice addition to the Scientists in the Field series. The book also looks at other urban spaces where a wild animal has a prominent place. I like the twist that this is going on in Cherrix’ own city. This books if well-done but who is the target audience? As a teacher and storyteller at my local library, I'm not sure who I would recommend this book to. It is very text dense and very technical. I felt like it was a good introduction for an adult but would a child/teen pick this up? Just curious. It's rare that I actually enjoy a non-fiction book, but in this case I did. 1: bears are such interesting animals. 2: Yoshi looks like a black bear to me. 3: I learned a lot and loved looking at the photos included. Like. Really loved it. Oh, Amy Cherrix. What a fantastic book! I love meeting the team of scientists, seeing how they work and learning more about bears. Excellent nonfiction for 3rd-high school. Beautifully written with gorgeous photos. Longer text. Non fiction. Great for classroom reports on bears, understanding scientists in the conservation field and what they do. Great photographs. Recommend for 2nd grade and up. One book in an excellent series for the budding scientist. Wonderful book about bears joining the urban world and how human are working to make sure they survive. A bit repetitive at time but worth the read. Great photo's.